Please refer to the Workflow Overview UPDATE LINK article for context. 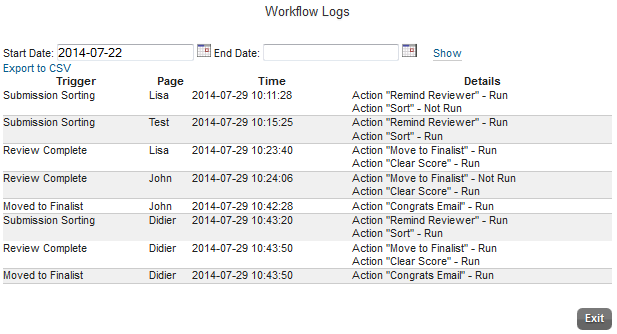 The Workflow Log provides detail on every Trigger and Action run during a time period. It is the first place to look when testing Workflows to ensure that the Triggers and Actions are running as expected. The Workflow Report shows you a summary of the Triggers and Actions in your workspace and helps you to visualize. When in the Workflow tab, find the button that says "Workflow Log." You will see this screen after clicking. You can use the log in order to view the actions and triggers fired within a specific time period. A list of the Trigger, Entry, Time, and Details that have and been evaluated will be listed for the date range. The Time column indicate when the Trigger condition was evaluated, and the Details column indicate whether each corresponding Action was run. You may export this view to a .csv file by clicking Export to CSV under the Start Date Field.